Prowler offers a large line of versatile standard and heavy-duty attachments for Skid Steer Loaders and Compact Track Loaders. 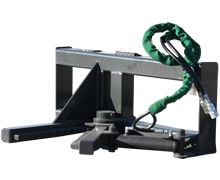 A universal quick attach plate allows our products to work with nearly all makes and models such as ASV, Bobcat, Caterpillar, Case, Gehl, John Deere, Mustang, New Holland, and Takeuchi. 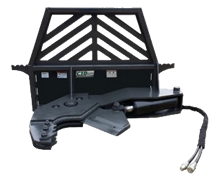 The performance and efficiency of skid steer attachments is important to owners and operators. All of our products have been engineered and tested in order to meet the demands and service expected of heavy-duty equipment. 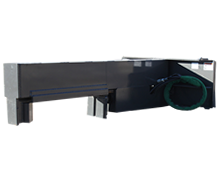 From heavy duty welds, steel fabrication, hydraulic lines, greasable hinge points and safety features, you will be very pleased with the design of your new loader attachment. 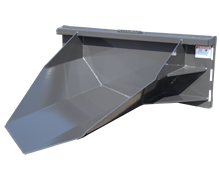 If it carries the Prowler name, you can be assured that you’re getting a quality, cost-effective product that meets the demands of today’s construction industry. Best of all, our attachments are proudly made here in the USA! 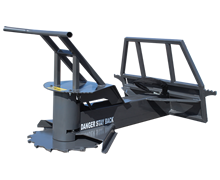 We have hundreds of durable, high quality skid loader attachments such as Pallet Forks, Root Grapples, Buckets, Augers, Brooms, Brush Cutters, Tree Shears, Rakes, and more. All of our attachments are backed by a 1 year, 1,000-hour warranty that covers manufacturing defects. We provide quick, reliable shipping anywhere in North America, including Alaska and Canada. When you are looking to invest in quality attachments for your skid steer, make sure you give Prowler a call before you buy. At Prowler, you will find expert sales associates who have been in the business for many years and know the product. They understand the value of engineering and design. Prowler Mfg. products are warranted to be free from defects in workmanship and/or materials for a period of (12) months from the date of sale. Warranty does not cover normal wear items, including but not limited to, bearings, hoses, ground engaging parts such as, teeth, blades, cutting edges, pilot bits, auger teeth and broom bristles. Warranty does not cover maintenance, service or adjustments. Warranty does not cover damage due to misuse, negligence, accidents, or improper maintenance. Warranty does not cover damage due to improper application, installation, adjustment or setup. Warranty does not cover improper modifications of product. Warranty is void if any components have been disassembled, i.e. pumps, gear boxes, motors. This warranty does not cover replacement parts not supplied by Prowler Mfg. Our obligation under this Limited Warranty shall be solely limited to repairing or replacing any part (see non-covered items) free of charge that, according to our judgment, show evidence of a defect in quality of workmanship or materials for the stated (12) month warranty period. All defective parts must be routed directly to Prowler Mfg. with freight or delivery charges to be prepaid. This Limited Warranty shall not be interpreted to render Prowler Mfg. liable for any injury or damage to persons, business or property of any kind nor expenses or losses incurred for labor, supplies, substitute machinery rental, or for any other reason. Repair or replacement parts are subject to the supply conditions at the time of repair or replacements, which may directly affect our ability to obtain material and/or replacements parts. Prowler Mfg. reserves the right to make improvements in design or changes in specifications at any time without incurring any obligations to owners of previously purchased units. No one but Prowler Mfg. is allowed to alter, modify or enlarge this warranty nor the exclusions, limitation and reservation at any time. All Prowler Attachments are manufactured in Denton, North Carolina by Construction Implements Depot, established in 2003, that specialize in manufacturing high quality, dependable Tractor, Track Loader, and specialty Skid Steer Attachments.